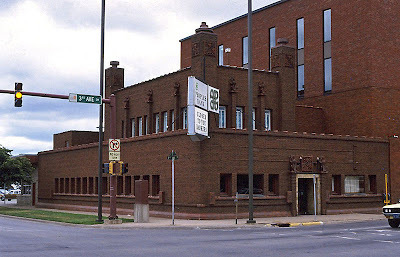 ArchitectureChicago PLUS: Louis Sullivan Cedar Rapids Bank: on Fatal Side of Proposed Levee? Louis Sullivan Cedar Rapids Bank: on Fatal Side of Proposed Levee? 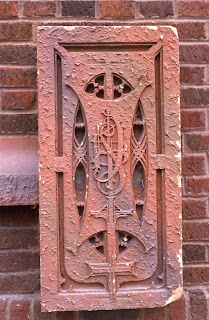 Paulina Saliga of the Society of Architectural Historians has brought to our attention an on-line petition drive against an ambitious anti-flood plans by Cedar Rapids, Iowa that could be putting in peril the future of the Louis Sullivan designed Peoples Savings Bank from 1911, which stands less than a block from the riverfront. The building, which had undergone a major restoration under the direction of Wilbert Hasbrouck in 1991, sustained major damage to its main floor and basement, including a reported destruction of original construction drawings, in the disastrous flooding of this past June. Earlier this month, plans were unveiled for a new Cedar Rapids flood protection system that would see the construction of a huge new levee downtown requiring the moving, or - more likely in a city that has no real idea of how its going to compensate owners whose properties would be seized - the demolition of the Peoples Savings Bank, currently a Wells Fargo branch, which at last report remains closed. The initial estimate for the cost of the overall flood control proposal is $1 billion, or nearly $8,000 for every one of Cedar Rapids' 126.000+ residents. You can read the text of a petition against the proposal, which would impact 500 homes and businesses and leave historical landmarks like the Sullivan bank unprotected, and add your own name here. And in way of things I found while looking up other things, here's a wonderful appreciation of Louis Sullivan by Sarah Vowell, in a video recorded at the Metropolitan Museum's reconstruction of a staircase from the Chicago Stock Exchange Building. It's a beautiful work of art. But in my opinion, it is a beautiful work of art that is in the wrong place. The levee should be built. The bank building is in a flood zone. That means the bank built should be moved. With computer-synchronized rubber-tired dollies, moving this bank can be done, either in whole or in two pieces. I'm not overly concerned about losing this building because of its looks but more the reasoning for the proposed demolition. Ding, Dong, the Scaffolds Gone! Uncle Sam: State Street Slumlord? And to think I saw it all on State Street!